The cluster lies at an approximate distance of 13,000 light years from Earth and has an apparent magnitude of 6.1. It has the designation NGC 6838 in the New General Catalogue. Messier 71 is one of the smallest globular clusters known. It occupies an area of 7.2 arc minutes of apparent sky, which corresponds to a spatial diameter of 27 light years. M71 is located within the Summer Triangle asterism, formed by the bright stars Deneb, Altair and Vega. It lies just into the triangle going from Altair, halfway between Gamma Sagittae (magnitude 3.5) and Delta Sagittae (3.7), two stars that form part of the Arrow asterism. M71 can be found 2 degrees to the southwest of Gamma Sagittae. The cluster appears as a hazy patch of light in binoculars. Small telescopes begin to hint at resolution, but to resolve the cluster into stars, one needs at least a medium-sized telescope. The best time of year to observe M71 is during the summer. Messier 71 is about 13,200 times more luminous than the Sun and has about 17 percent of the Sun’s heavy elements (or metals), which is quite a lot for a globular cluster. Stars in globular clusters are generally very old and very metal-poor. For this reason, astronomers debated whether M71 was a globular or an open cluster for centuries. 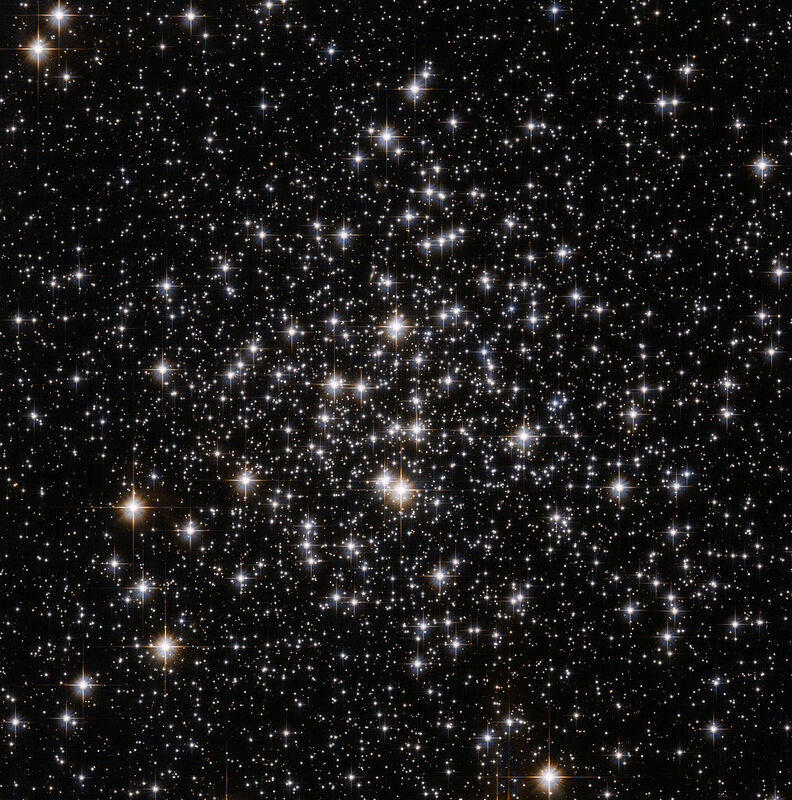 The diameter of M71 may extend to about 90 light years, but the stars that are further away from the centre and more diffuse are not confirmed members of the cluster. The cluster has a mass of about 17,000 solar masses. It contains at least 20,000 stars, but lacks RR Lyrae-type variables, which are commonly found in globulars. This is explained by the relative youth of M71. The cluster has an estimated age of 9 to 10 billion years, which also explains its abundance of metals. 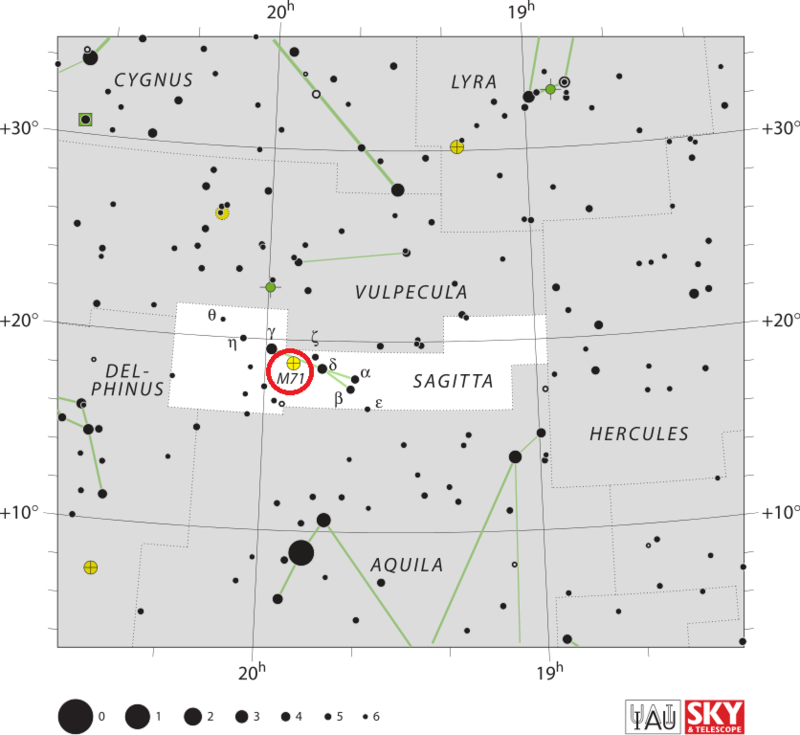 Messier 71 is home to the irregular variable star Z Sagittae, a red giant star with the spectral classification of M6IIIe that shows variations from magnitude 13.5 to 15.7 over a period of 190.8 days. Z Sagittae is one of the six known M-type giant stars in M71. 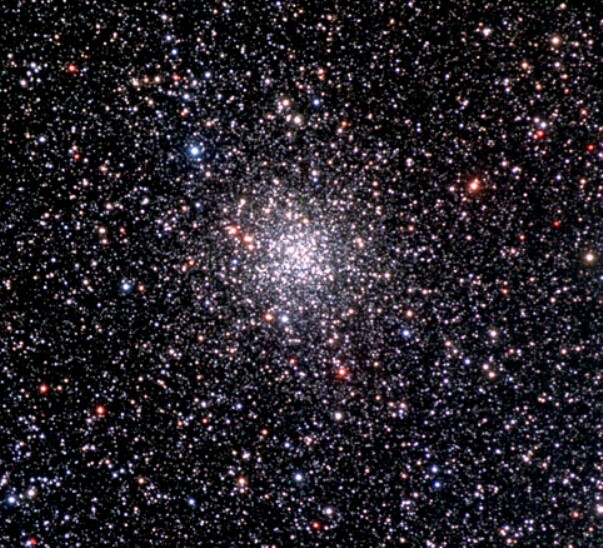 Until the 1970s, M71 was believed to be a densely populated open cluster, much like Messier 11 (Wild Duck Cluster), and classified as such. 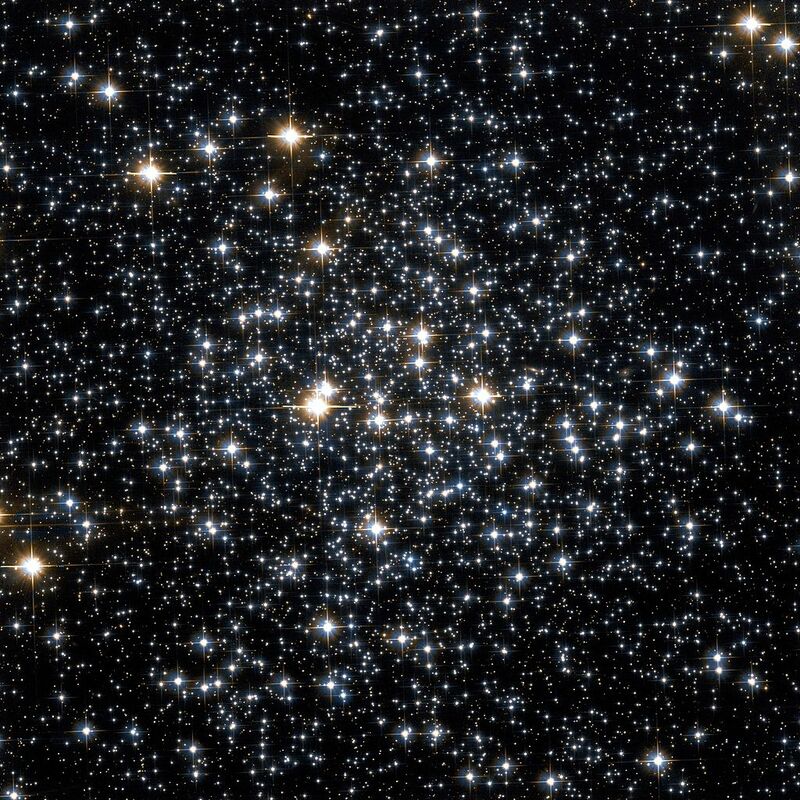 In 1943, James Cuffey of Kirkwood Observatory in Bloomington, Indiana, found that it was more like a loosely populated globular cluster, one like Messier 68. 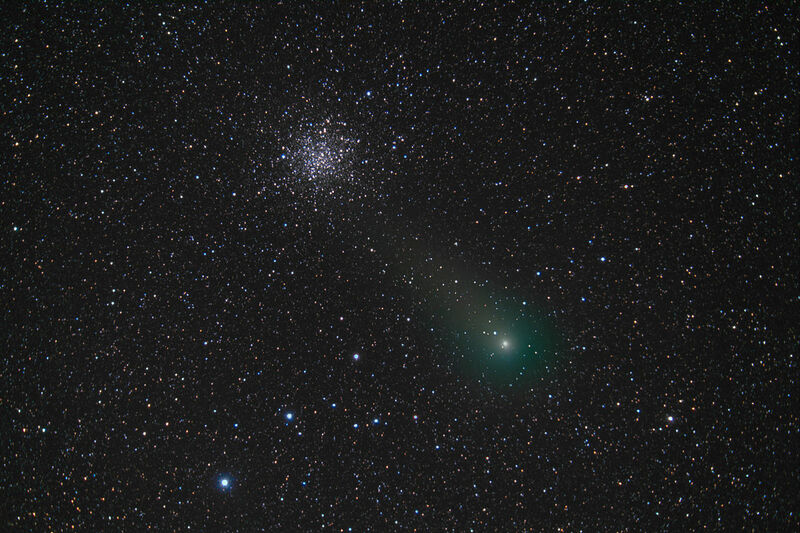 However, further studies in 1959 once again pegged M71 as an open cluster. Today, M71 is classified as a very loosely concentrated globular cluster, with a density classification of X or XI. A rich compressed Milky-Way cluster on the shaft of the arrow, and 10deg north-a quarter-east from Altair. It was discovered by Mechain in 1781, and described by Messier as a nebula unaccompanied by stars, and of a very feeble light. Piazzi seems to have observed it meridionally as a star of the 8th magnitude, by admitting the light of a lamp upon it (312 P. xix), but his darkened field ought to have shown that it is flanked with four telescopic stars, besides other larger companions in view. It was first resolved into stars by Sir William Herschel, in 1783, who esteemed its profundity to be of the 243rd order.